Bali is famous because of the unique culture, a thousand temples, a lot of beautiful beaches, and nature. One of Bali’s beautiful natures is shown by a lot of waterfalls. In Buleleng there are amazing waterfalls. One of them is Gitgit Waterfall or locally referred to as “Air Terjun Gitgit”. The beauty of the flow of the waterfalls is derived from the natural mountains with natural forest environment. There, the air is cool and far from the city. No wonder that the Gitgit waterfall became one of the tourist attractions for those of you who like the beauty of nature. Gitgit Village is famous for the highest waterfall in Bali. 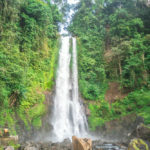 The location of the Gitgit Waterfall is in Gitgit Village, Sukasada district, Buleleng regency. From Singaraja city, it’s just about 11 kilometers to the south. And it is about 90 kilometers from Denpasar. 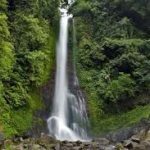 Gitgit Waterfall is a good waterfall for you who are adventure lovers. In Gitgit waterfall, you can try the adventure trekking with terraces and wind terraces up and down that is highly recommended for your adrenaline rush. To find the location of the Gitgit Waterfall from the parking area, the visitors must walk about several hundred meters through the path of rice fields, clove gardens, and coffee. Sightseeing Gitgit waterfall offers a cool natural nuance in the highland areas of the mountains. After arriving in the waterfall, visitors can see the natural and the beauty of the waterfall that plastered the front of the eye. A gentle breeze was carried along the dew or steam that the wind blew on the face that feels so fresh. There is also a grove of trees and rifts of shrubs on the cliff that seemed to add to the naturalness of Gitgit Waterfall. Gitgit Waterfall object in Bali has become one of the mainstays of Buleleng Regency. Gitgit waterfall object is very easy to find. Moreover, there is two waterfalls in Gitgit Village those are offering the amazing panorama. Do you want to buy souvenirs? Don’t be afraid, here is ready for shopping a beautiful souvenir.